If you have any questions or comments, please fill out the form below and we will be sure to respond as soon as possible. Thanks for contacting Glacier Aviation Services. You will receive the information by email. Please make a selection.I want information on HELI TOURING.I want information on services and rates FILMING ONLY.I am looking for STOCK FOOTAGE.I want to know your FILMING AVAILABILITY. Please GO here TO BOOK A FLIGHT. We use this information to prepare a Reservation Request and we will email the request to you to pay with ACH or credit card. We do not input your data you will via the invoice. Let us know what your preferences are and we will get back with you to confirm your preferred choices or to suggest alternatives. We definitely suggest morning flights. If you have a party larger than 4 or with combined weights over 680 pounds you will need to book multiple flights. No - I want to book with the passengers listed below and flight selected and get confirmed now.Yes - I want to be on the waitlist and wait to see if a lower priced flight can be arranged later. We can place you on a waitlist with other passengers and we will try to combine you with other passengers but YOU MUST purchase the lowest fare to be placed on the waitlist. We CANNOT guarantee that we can place you with others. In that case, if we cannot provide your selected flight within 24 hours of your date requested you can upgrade the fare to one which is available or we will refund your fare at the time of the requested flight. The weights for passengers must average 170 pounds. Just add the total weights of your party and divide by the number to see if the average is under 170. I would like to receive special offers and discount emails. I would like to receive your quarterly newsletter. I would like to know of special events in the area. By checking this box you are authorizing us to communicate with you by email. In case you are wondering about Brutus. He is a 15 year old Alaska Brown Bear which is a close relative of the Grizzly Bear. He weighs in about 900 pounds and stands about 9 feet tall when on his hind feet. I first met him while doing aerial film work on a National Geographic program about these awesome creatures. 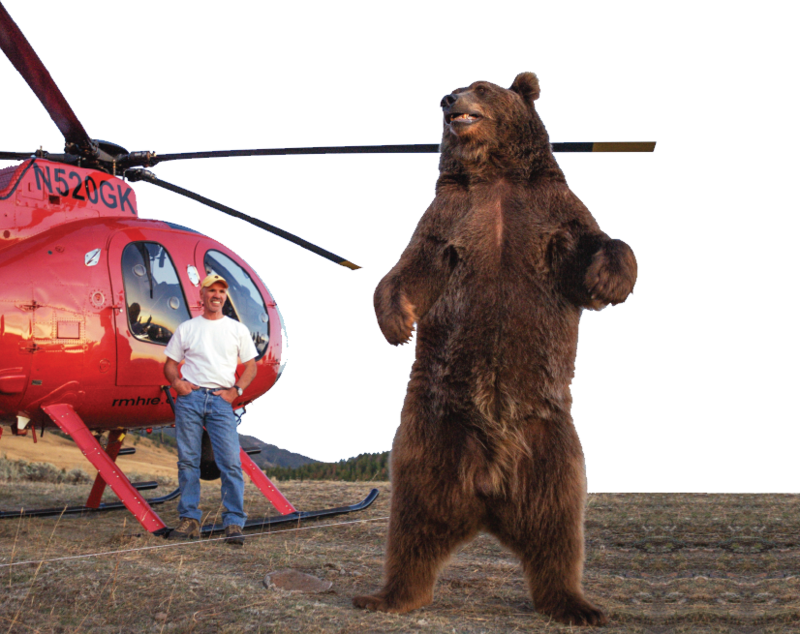 Brutus is owned by my friend Casey Anderson who operates the Grizzly Encounter near Bozeman, Montana where Brutus is an educational ambassador to the community for understanding Grizzly Bears. We provided the aerial shots for the initial show that was to air on NatGeo and as a gesture of appreciation Casey had Brutus do some promo photos for me with our filming helicopter. Copyright Ⓒ 2018 | Glacier Aviation Services, Inc.